It's a new VPCart Admin page that easily bolts into your Admin Menu - a very handy addon if your VPCart database has more than just a handful of products or categories in it. From the results page you can click on the link for each product or category and edit the product's/category's details to correct/change the image values. 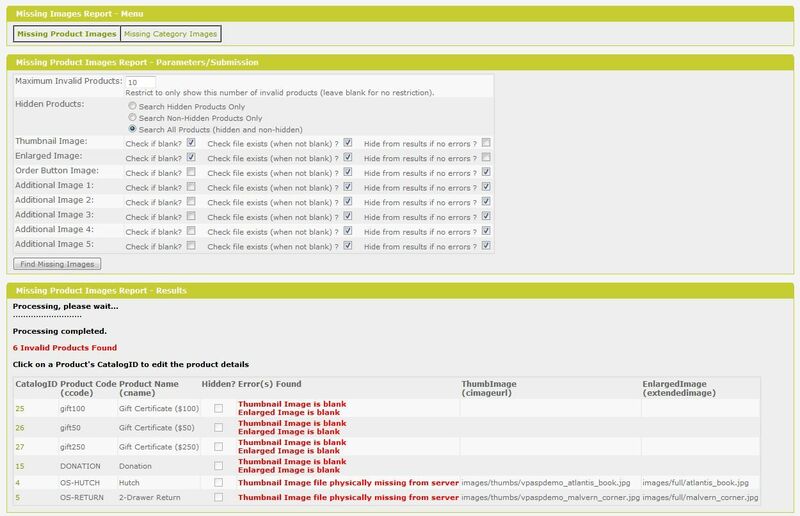 Allows you to configure checks for any image columns you want on your products and categories tables. The configuration file will allow you to specify any products and categories columns that you like to check for image URLs. 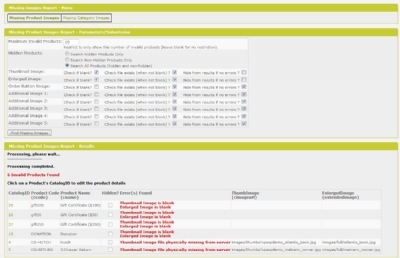 1) Check if the column on the products/categories table is blank (ie Image URL is not specified). 6) The values in your configured list of image columns as appropriate. 5) The values in your configured list of image columns as appropriate. 02 21-FEB-2006 Changed documentation to be compatible with VP-ASP V6. 03 03-AUG-2007 Upgraded BYZ038 (Licensing) module to cater for VP-ASP V6.5. Changed to use the relevant product database (shopopendatabaseP). Changed to use less memory by rediming the product arrays. Made compatible with VPASP V7 and general tidy-up of reporting screen. Added timeout setting for database connection to avoid sql cursor timeouts. 06 04-OCT-2010 Added extra logic to cater for more permutations of xmysite and image data values as some instances were causing incorrect results. Also tidied-up the html. Added extra config options so that you can specify as many different image columns to check as you like. Added extra screen/menu and config options to check for missing category images. Changed query to use less memory and to speed it up. Changed the file-existence check to be more efficient. Added running-dots to the results block to avoid script/session timeouts. Improved look/feel/styles of admin screen. Changed to use BYZ038 functions where available. Split documentation files out into separate sub-files and added version checker etc. Please Note: You must be using V29 or later of BYZ038 before upgrading to V07 or later of BYZ068. Please Note: You must be using V17 or later of BYZ036 before upgrading to V07 or later of BYZ068. 08 28-AUG-2014 Added extra config options and changed the screens/checks so that you can specify if you want to report on hidden, non-hidden, or all products/categories, and added a hidden checkbox on the results blocks to indicate if the product/category with the error is a hidden one. Changed the license/terms/conditions that relate to all BigYellowZone software/services. Tested and approved for compatibility with VPCart V8. Added extra logic to catch image values which have characters in them such as spaces or brackets or commas that would cause the find-path function to fail (previously these files would cause an asp error and you wouldnt know which file was causing the error).